The task was to add storage space, provide privacy, minimise overshadowing, and provide enclosure and a focal point for the private open space and living rooms of the dwelling - all in a contemporary, sculptural, functional and unfamiliar fashion. The direct use of material and structure of the existing garage was extrapolated to include the use of recycled materials - plywood & lights from Supermodels, stair framing from the existing hardwood trussed garage roof, fibreglass roofing from the main dwelling's construction, polycarbonate sheeting from a former office fitout. 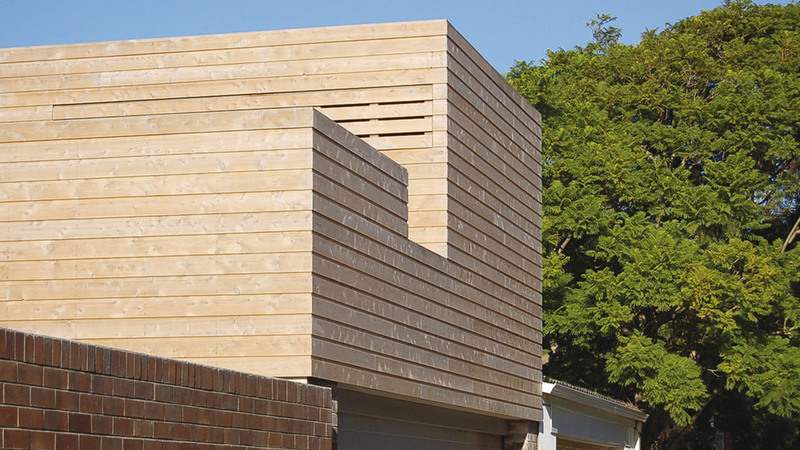 Cypress pine cladding was chosen for its economy, durability, sustainability, ability to weather silver and for its abundance of knots. Concrete lifted the timber stair off a wet floor. A traditional form was unacceptable to the client. Analysis of the surrounding lanescapes revealed a domain that council had forgotten. All similar recent additions had baulked at the contemporary. This provided a rich opportunity for dialogue through contrast.